Kiddush Lite. Mr and Mrs Eli Duban are sponsoring the cholent this week in honor of the birthday of their son JJ Duban. Cholent will be made by Rabbi Mendy Levitin. Seuda Slishit Lite. 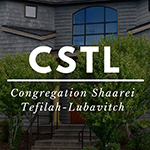 For current status of the North Seattle Eruv, please check the flag on the NE 65th Street side of CSTL, (green flag means the Eruv is up, red flag the Eruv is down), CSTL eNews, or the Vaad eNews. Visit our web sitewww.twitter.com/cstleruv for current status. If you would like to sponsor Kiddush at CSTL, please contact Marion KitzGabbai Kiddush, miriamkitz@hotmail.com . Contact Marion to sponsor a Kiddush for a BIRTHDAY, ANNIVERSARY or YAHRZEIT. Please inform Marion by the preceding Sunday evening so that we have time to prepare properly. Prices: Sponsor $350, co-Sponsor $175, Contributor: $50-$149. Seattle Kollel Beginning MON NOV 12th Mishna Yomit Seder Nezikin & Tractate Bava Kama. The International Conference of Shluchim begins this Shabbos, Parshas Chayei Sarah,and will be continued during the following days which are associated with Parshas Toldos.Since everything which occurs is ordained by Hashgachah Protis and a Jew should derive a lesson in the service of G‑d from everything he sees or hears, it follows that these two Torah portions contain lessons relevant to this conference and the responsibility of a shliach. Indeed, a major portion of Parshas Chayei Sarah concerns a shlichus, Avraham’s charging Eliezar with finding a bride for Yitzchok, and Eliezar’s execution of that mission. The following portion, Parshas Toldos describes the offspring of Yitzchok and Rivkah and thus, reveals the intent of that mission. Since Eliezar’s mission is described at length in the Torah, we can conclude that it is not merely an isolated historical event, but rather, contains directives of a greater scope that apply in all times. The lessons which we can derive from this narrative can be understood on the basis of a basic question: Why is this narrative described in such great length in the Torah?1 The objective of Eliezar’s mission, the marriage of Yitzchok and Rivkah, is described briefly while the description of the mission, the preparations for it, and the negotiations it required, is elaborate and detailed. The concept can be explained as follows: Eliezar’s mission in arranging for the marriage of Yitzchok and Rivkah reflects — in microcosm — the mission of every Jew, to make a dwelling for G‑d in the lower worlds. Rivkah was like “a rose among the brambles,” living in Padan Aram together the wicked Besuel and Lavan. Eliezar’s mission involved removing her from there and bringing her to Yitzchok to become his wife. Thus, it reflects our service of refining the material nature of the world and transforming it into a dwelling for G‑d. Since Eliezar’s mission reflects such an all encompassing objective, the Torah relates all the details of the mission so that a Jew can derive lessons from it regarding his service in making a dwelling for G‑d in this world. To explain: The objective of establishing a dwelling for G‑d in the lower worlds involves two particulars: a) the establishment of a dwelling — i.e., that G‑d will reveal Himself in this world as a person reveals himself in his own home. In his home, a person reveals himself without any inhibitions, so, too, in this world, G‑d will reveal Himself openly as the verse declares, “Your teacher will not conceal Himself any longer.” b) The fact that dwelling will be in the lower worlds emphasizes that it will relate to the creations of this world on their level. Not only will G‑dliness be revealed from above to below, but rather, the world as it exists within its own context will recognize G‑dliness. Although the world was created in a manner that it does not appreciate G‑dliness,2 its nature will be transformed until it — within the context of its own existence — will become G‑d’s dwelling. Accordingly, these two thrusts must also be reflected in the service which creates the dwelling for G‑d: a) Since the dwelling must be within the context of the lower worlds, it cannot be established by G‑d through a revelation from above. Rather it must be accomplished through the service of the Jews, who act as G‑d’s shluchim within this world. This leads to a further point, since the Jews are creations of this world, their activity as shluchim [— which involves forgoing their individual identities and accepting a self-image as G‑d’s shluchim —] is not only a preparation and a means to establish a dwelling for G‑d, it, itself, is a reflection of that dwelling. To emphasize this concept, the narrative of Eliezar’s mission which serves as a paradigm for shlichus, describes in detail how Eliezar fulfilled the mission with which he was charged. b) To transform the world into a dwelling for G‑d, i.e., a place of Divine revelation, it is necessary for the Jews to recognize that they are merely shluchim. They must be conscious that it is the power of G‑d who charged them with this mission and not their individual potential that allows the mission to be successful. To emphasize this point, our narrative elaborates on how Eliezar was charged by Avraham with his mission, how he took an oath, stressing how the shliach’s activities are carried out with the power of the one who appointed him. a) The shliach is an independent identity and the deeds which he accomplishes are recognized as his. It is merely that through the performance of these deeds, the obligations of the person who charged him with the mission are fulfilled. b) When the shliach performs a deed, it is considered as if it was performed by the person who charged him with the mission. Though in regard to his other affairs, the shliach is an independent entity, in this regard, the one who charged him is fully responsible for the deed the shliach performed. The relationship between a Jew (the shliach) and G‑d (the one who appointed him) is defined in the third manner. The Jew’s establishment of a dwelling in the lower worlds is possible because he is “a part of G‑d,” i.e., like the one who appointed him. Service is necessary, however, to reveal this quality. A person must work on himself to transcend his individual self and identify with G‑d’s will. It is not sufficient for him to perform a G‑dly act [a mitzvah] although he remains a separate and individual identity. Rather, he must be totally given over to G‑d to the extent that every aspect of his personality — even those involved with physical activities — is given over to G‑d. For this reason, the appointment of the shliach by the one who sends him is of such importance. The appointment of shluchim implies that the person appointing them gives them powers.3 In terms of our fulfillment of the shlichus with which we have been charged by G‑d, this concept fuses two opposite thrusts. On one hand, a Jew feels himself as an independent entity, a soul and a body, who has a personality of his own and, must realize that he personally was granted unique potentials to achieve particular objectives in the service of G‑d. Nevertheless, while carrying out this service, his own personality must be totally nullified to the extent he is totally identified with G‑d who appointed him as His shliach. 2. The above concept provides the basis for the connection between the narrative of Eliezar’s mission and the name of the parshah, Chayei Sarah (“the life of Sarah”). Though the name of an entity expresses its fundamental content, in this instance, the connection between Sarah’s life and the events related in the parshah is difficult to understand. All those events occurred after Sarah’s death. In particular, the expression used by the Torah in describing Sarah’s age, “one hundred years, twenty years, and seven years,” is significant. “One hundred” refers to the transcendent powers of will and pleasure, “twenty” refers to our intellectual powers, and “seven” to our emotions. Afterwards, the verse concludes “the years of Sarah’s life,” which our Sages interpret to mean that “all are equal for the good.” This reflects how all the soul’s powers are unified into a single point, brought together through the bittul of yechidah, the essence of the soul, which is above all division. Nevertheless, this essential point of soul permeates through all the soul’s powers and unites them in this all-encompassing bittul. To relate this idea to the concept of shlichus described above: As mentioned, our fulfillment of the mission to make this world a dwelling for G‑d involves the fusion of two opposites: a) the shliach using all of his powers (his will and pleasure, intellect, and emotion in the fullest way possible. b) the shliach giving himself over to G‑d entirely, focusing all his powers on a single goal, the fulfillment of G‑d’s will. We derive the power to fuse these two opposites from Sarah, our Matriarch. She endowed us, her descendants, with the potential for the essence of the soul to permeate every aspect of our personality (“all are equal for good”) and to unify will and pleasure (“one hundred years”), intellect (“twenty years”), and emotion (“seven years”) in this all encompassing bittul. Through revealing the aspect of Mashiach which relates to him, each individual hastens the actual coming of Mashiach as alluded to in the Rambam’s statement that with one mitzvah, each Jew has the potential to tip the balance of the entire world and bring complete salvation. These activities are also related to bringing about “offspring” in another context. The Previous Rebbe explained that the mitzvah to “be fruitful and multiply” means that “one Jew must make another Jew,” i.e., influence another Jew to express his Judaism.5Furthermore, the influence one exerts on others must be complete, powerful enough to motivate that person himself to go out and spread Judaism to other people. “The son of Avraham” implies that it is openly apparent — to the extent that the facial characteristics of Yitzchok and Avraham were identical — that he is a descendant (and the heir to the heritage of) “the father of many nations,” the person who is involved with spreading the service of establishing a dwelling for G‑d throughout the world at large. The Hebrew word Toldos (“offspring”) is plural, referring to Yaakov (the service of “doing good”) and Eisav (the service of “turning away from evil”). The establishment of a dwelling for G‑d involves both these services. Furthermore, in an ultimate sense, since Eisav is also a son of Yitzchok and Rivkah, the service he connotes does not involve merely the negation and rejection of evil, but rather, its elevation and refinement.6 The establishment of a dwelling for G‑d in the lower worlds requires both the service of Yaakov, “a straightforward person, a dweller of tents” (the service of Torah and mitzvos), and Eisav, “a man of the field” (the service of refining and elevating the material substance of the world). This will lead to the era when, “I will come to my lord in Seir,” when Eisav will be elevated and prepared to accept the Messianic redemption. On the basis of the above, we can understand the sequence of the parshiyos from Lech Lecha to Toldos. Lech Lecha refers to the bittul that motivates a journey from one’s previous state. This prepares a person for Vayeira, a revelation of G‑dliness. Chayei Sarahinvolves the expression of this revelation through every element of our personalities which gives a person the potential to produce Toldos, “offspring” and establish a dwelling for G‑d in this world. 4. The above concepts are fundamentally related to the International Conference of Shluchim which begins this Shabbos. All Jews are shluchim of G‑d to establish a dwelling for Him in this world. Particularly, when an individual is appointed as shliach of the Previous Rebbe, his role in fulfilling the shlichus with which he has been charged by G‑d receives greater emphasis. Surely, this applies when shluchim from all over the world have gathered together. Each of their missions must relate to two of the points mentioned above: a) Each shliach must use his full potential (all of his ten powers) for the sake of the fulfillment of the mission. b) Each shliach must be totally given over to the one who appointed him, the Previous Rebbe, and thus, standing in the place of the one who appointed him. The fusion of these two contradictory points relates to a similar fusion of two opposites: a conference (unity) of shluchim (who are many). This is particularly relevant in regard to an international conference where shluchim are gathered from all over the world — this is especially significant when this conference is held in a Shul which is a house of study — for the sake of strengthening their commitment to the fulfillment of their shlichus to spread Yiddishkeit, Torah, and goodness throughout the world. The general nature of this shlichus, however, must be interpreted in an individual manner by each shliach in order to influence his particular country and situation. By gathering together in such a conference, all the shluchim receive greater strength and potential to carry out this mission. In particular, additional power is granted this year, the fortieth year after the Previous Rebbe’s passing.7 Our Sages explain that after forty years, a student attains a full grasp of his teacher’s knowledge.8 Thus, the fact that forty years have elapsed since the Previous Rebbe’s passing implies that we are granted the potential to reach a higher rung in the fulfillment of the mission to make this world a dwelling for G‑d. This must be reflected in the two aspects of shlichus mentioned above: The shliach’s bittulmust be more complete and encompassing. Simultaneously, that bittul must inspire him to dedicate all of his potentials to the fulfillment of his mission. In application of the above: The intent of the conference of shluchim should be to strengthen each other to spread ahavas Yisrael (“the love of our fellow Jews”) and achdus Yisrael (“the unity of the Jewish people”). The first step in accomplishing that objective is spreading love and unity among the shluchim themselves. Though they come from different places with different missions particular to their individual situation, they join together in one conference with a single goal. The unity established in this conference through praying, studying, and accepting resolutions together should continue to have an effect when each shliach returns home. In his own individual circumstances, he should feel connected to the other shluchim and to the one who appointed them. This unity will grant the shluchim the potential to spread unity among the Jews in the countries in which they dwell. Through these efforts, the entire world will become united in the fulfillment of G‑d’s will; the Jews, through the performance of the 613 mitzvos and the gentiles, through the observance of the seven universal laws given to Noach and his descendants. To strengthen the unity among the shluchim, it is proper to print a book to serve as a constant reminder of this conference. This book should include: pictures of all the participants in the conference including their families, new Torah concepts that were authored by the participants in the conference, and a record of the speeches and resolutions made during its interim. Also, Torah concepts and resolutions that emphasize the unique nature of the present year, the fortieth year after the Previous Rebbe’s passing should also be included. When a shliach returns to his own community and opens this publication, he will remember this conference. This will inspire him to further efforts in fulfilling his mission. This is also an appropriate opportunity to reiterate the suggestion made regarding gathering people together in every community each Shabbos to study Torah and focusing that study on a common subject, the weekly Torah portion. Similarly, it is important to emphasize the study of the Rambam’s Mishneh Torah which was completed in the previous week.9 It is proper to organize siyumim (celebrations in honor of the summation of study) in communities throughout the world. Rabbis and community leaders should be encouraged to attend these gatherings which will bring honor to the Rambam and honor to the Torah as a whole. Through spreading the study of the Rambam — a text which includes “the entire oral law” in a manner that can be understood by “those of lesser stature as well as those of greater stature” — throughout the world, the Jewish people become united in a bond of Torah. May these efforts hasten the fulfillment of the prophecy with which the Rambam concludes his text, “And the earth will be filled with the knowledge of G‑d as the sea covers up the ocean bed,” with the coming of Mashiach. May it be now, immediately.